The texture of this cake looked different than my Pandan yogurt cake. 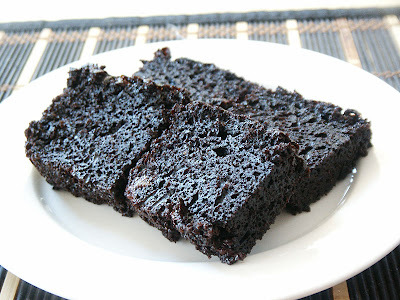 It looked spongy but in reality it was soft and moist and packed with chocolate flavor. My daughters loved it and asked me to make it again. 1. Preheat oven to 350'F. Grease a 8.5x3.5 loaf pan. 2. 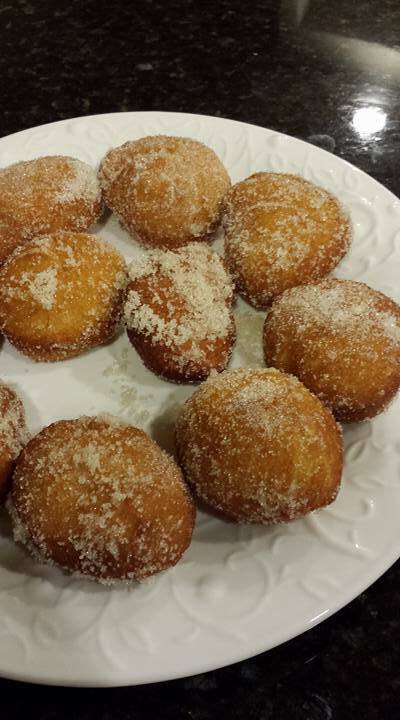 In a large bowl, sift in flour, cocoa powder and baking powder. Add in salt, sugar. Stir to mix well. 3. Then, add in all the wet ingredients: yogurt, eggs, coffee and oil. Use a whisk and whisk everything together until blended. 4. Pour into the prepared loaf pan and bake for 50 minutes or until toothpick inserted in middle comes out clean. Cool in pan for 5 minutes before taking it out to cool completely on wire rack. sound easy hoh? but my baking very lousy one lah!! dun know why. i think i wanna try your pumkin cake (since now is Pumkin season! )but can i omit the cinnamon powder? i so dislike this taste lah. WOw that indeed looks like the name say, dark. I would love to have a taste of it, to see if it is bitter as you added dark chocolate powder. Ching, it looks good. I feel like trying your healthy version. This is the first time I came across yogurt cake. What a healthy version! Brilliant idea to add in dark chocolate. It looks so yummy! I luv it! ooo. I'm at work now but I will certainly bookmark the recipe when I reach home. It looks really good. And I like it dark! Nice recipe Ching, Hmm...with coffee can be really good!. 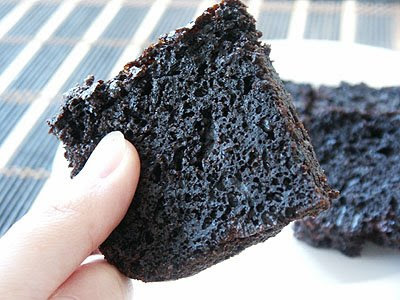 If you had not said it was dark chocolate in the making of this cake, I would have thought it was some "squid-ink" cake.....so black! thank you thank thank you. i've been looking for nice, moist chocolate cake for awhile now. do you think veggie oil would work, in lieu of the canola? Gigi, yes you can omit the cinnamon powder. :) This pumpkin cake is very good, worth a try. Oh, you can try this yogurt cake, very easy! Happy cook, yeah I would have thought it would be bitter too since I didn't add more sugar. Luckily it's not bitter but very dark in color. Thanks daphne. It's so easy this can be done in less than 30 minutes. Haha tigerfish, really black hor? I thought so too. That's a really dark chocolate cake. Haha. I think I used that same cocoa too... it's the dutch-processed one, ya? I used it in my ice-cream and sponge cake. Hi, your cake looks special, so happy to find a healthier cake, looking forward to more variations. Can I omit the tablespoon of coffee? Can I replace Canola oil ith olive oil? Beachlover, yeah try with dark chocolate/cocoa powder next time. Yes, you can omit the coffee. Normally I won't suggest you to replace it with olive oil because olive oil has olive smell. I never bake with olive oil before so I have no idea whether the cake will turn out smelling a little like olive oil or not. this is great for my kids. will try out when i m free, they love chocolate cake. but can i replace canola oil with normal cooking oil? Yes you can olive oly, just not strong smelling oil, preferably neutral oil. i keep coming back to this post, it looks so good! i was wondering if it'd be too much to have icing??? freshman year of college, during exam week, i lived off of chocolate cake and white icing. i'd like to make this cake but have icing too but if it's too much... what do you think? thank you! I don't think it's too much, if you like icing, go ahead and use it. This cake is not too sweet to begin with. So enjoy! Thanks so much for this wonderful recipe. I made it yesterday and boy was it good!!!! Your green tea cupcakes and Pandan cake was great as well!!! hi what type of yogurt do you use? Ling, any brand of plain yogurt would do. I got mine in big tub which is cheaper. hi, my cake sunk after taken out from the oven. is it because i use self raising cake flour instead of multi purpose flour + baking powder?